Please check out Newest Released DRST Family including Universal Programmable Signal Transmitter DRST-UN Standard Model, DRST-UR Relay Outputs Model, DRST-AC AC Inputs Model, and DRST-FR Frequency Inputs Model for more advanced features with better price. The DRG Series signal conditioner modules accept a wide variety of input signals such as thermocouples, RTDs, strain gages, DC voltages/currents, AC voltages/currents, frequency and potentiometers and produce a proportional conditioned process output. The inputs and outputs are both field configurable and offer flexible wide ranging capability. The slim housing mounts on a DIN rail and is ideal for high density installation. 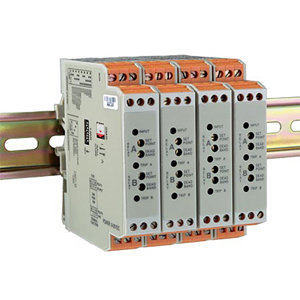 All modules provide 1800 Vdc isolation between the input, output and power supply. One advantage of the DRG series is the field configurable input and output ranges. Each module can be set to a number of ranges by dip switch selection. Wide ranging precision zero and span potentiometers provide even further adjustment. The signal conditioners may be set for an almost limitless number of ranges. Range adjustment requires the use of a calibrator or reference source. The DRG-SC-TC is a DIN rail mount thermocouple input signal conditioner. It can be field configured for over 60 different thermocouple temperature ranges. The output is linear to temperature and can be set for either 0-5 V, 0-10 V, 0-1 mA, 0-20 mA or 4-20 mA. Zero and span pots allow 50% adjustability of offset and span turn down within each of the ranges. For example the 500-1000°C range could be offset and turned down to provide a 4-20 mA signal representing 750-1000°C. The DRG-SC-DC is a DIN rail mount DC voltage and current input signal conditioning module. The input can be field configured for any one 12 voltage ranges from 10 mV to 100 V or 6 current ranges from 1 mA to 100 mA. The output is linear to the input and can be set to either 0-5 V, 0-10 V, 0-1 mA, 0-20 mA or 4- 20 mA for the DRG-SC-DC-U (unipolar outputs) and -5 V to +5 V or -10 V to +10 V for the DRG-SC-DC-B (bipolar outputs). Zero and span pots allow 50% adjustability of offset and span turn down within each of the ranges. For example the 0-2 mA input range could be turned down to 0-1 mA and provide a full scale output signal (e.g. 4-20 mA). The DRG-SC-BG is a DIN rail mount bridge or strain gage input signal conditioning module. The field configurable input and output offers flexible, wide ranging capability for bridge or strain gage applications from 0.5 mV/V to over 50 mv/V. Wide ranging, precision zero and span pots allow 50% adjustability of offset and gain within each of the 11 switch selectable input ranges. The output can be set for either 0-5 V, 0-10 V, 0-1 mA, 0-20 mA or 4-20 mA. This flexibility, combined with an adjustable (1 to 10 Vdc) bridge excitation source, provides the user a reliable, accurate instrument to isolate and condition virtually any bridge or strain gage input. The DRG-SC-RTD is a DIN rail mount RTD input signal conditioning module. It accepts a wide variety of RTDs including 100, 500 and 1000 Ohm Platinum RTDs as well as 10, 25 and 100 Ohm copper. It works with RTDs with α = 0.00385Ω/Ω/°C or 0.00392Ω/Ω/°C The input can be field configured for any one of up to sixteen temperature ranges. The output is linear to temperature and can be set for either 0-5 V, 0-10 V, 0-1 mA, 0-20 mA or 4-20 mA. The DRG-SC-FR is a DIN rail mount frequency input signal conditioning module. The field configurable input and output offers flexible, wide ranging capability for a variable frequency drives, magnetic pickups, turbine meters and other pulse or frequency output transducers. The output can be set for either 0-5 V, 0-10 V, 0-1 mA, 0-20 mA or 4-20 mA. The DRG-SC-FR can be configured for virtually any frequency input to DC signal output within the ranges specified. Calibration utilizes technology where the user simply applies minimum and maximum input frequencies, touching a recessed button to configure the minimum and maximum output range. The DRG-SC-PT is a DIN rail mount potentiometer input signal conditioning module. The input provides a constant voltage and is designed to accept any three-wire potentiometer from 100 . to 100 K.. The field configurable output can be set for either 0-5 V, 0-10 V, 0-1 mA, 0-20 mA or 4-20 mA. Wide ranging, precision zero and span pots, used in conjunction with DIP switches, allow 80% adjustability of offset and gain to transmit a full scale output from any 20% portion of the potentiometer input. Note: Each DRG-SC Series signal conditioner is supplied with a complete operator's manual.